The good news is that each of us can start at any time to avoid or correct the problems associated with poor posture, and improvements can also begin at any age. 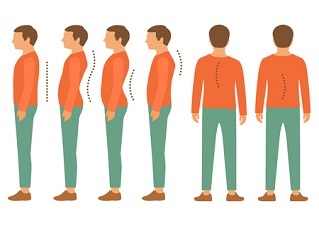 It may come as a great surprise to many people that posture is just as important to health as a sensible diet, a consistent exercise program, adequate rest and avoidance of harmful substances, such as tobacco, drugs and alcohol. Good posture helps to energize the body and reduces stress and fatigue, leading to a higher level of physical fitness. The good news is that each of us can start at any time to avoid or correct the problems associated with poor posture, and improvements can also begin at any age. ⦁ We watch more television than any previous generation. • We are more electronic dependent, with more and more individuals working at sedentary desk jobs or sitting in front of computer terminals. ⦁ More cars are crowding the roads, resulting in accidents and injuries affecting posture. • We drive in cars and sit in airplanes with poorly designed seats for extended periods of time. ⦁ Keep weight down. Excess weight pulls on the back. • Exercise regularly. This helps keep the body flexible and muscles toned for proper muscle support for the spine. ⦁ Sleep on a good mattress; it helps properly support the spine. • Pay attention to injuries from bumps, falls and jars. Injuries in youth may cause growth abnormalities or postural adaptations to the injury that can show up later in life. ⦁ Get regular spinal checkups. A doctor of chiropractic is trained specifically to reduce biomechanical stress from poor posture that can hinder proper body function. Chiropractors offer a solution to your health problems! Call Waterford MI chiropractor, Dr. Miller today and discover the change chiropractic can bring! Click here for our Introductory Special.